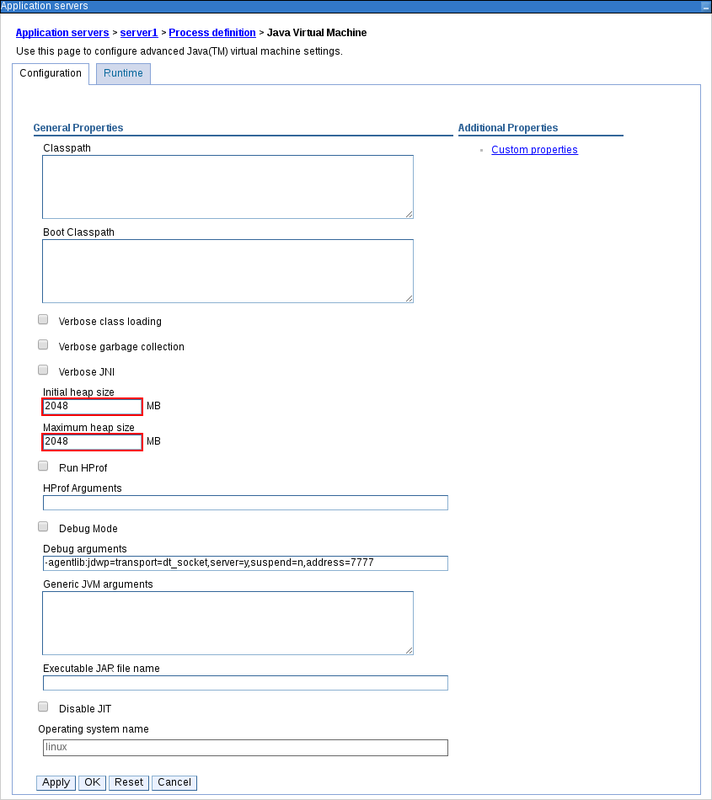 A guide to installing and configuring Red Hat JBoss BRMS on IBM WebSphere Application Server. Red Hat JBoss BRMS is an open source decision management platform that combines Business Rules Management and Complex Event Processing. It automates business decisions and makes that logic available to the entire business. Red Hat JBoss BRMS use a centralized repository where all resources are stored. This ensures consistency, transparency, and the ability to audit across the business. Business users can modify business logic without requiring assistance from IT personnel. Business Resource Planner is included with this release. Red Hat JBoss BRMS is supported for use with Red Hat Enterprise Linux 7 (RHEL7). IBM WebSphere Application Server (hereinafter referred to as WAS) is a flexible and secure web application server that hosts Java-based web applications and provides Java EE-certified runtime environments. WAS 8.5.5 supports Java SE 8 and is fully compliant with Java EE 7 since version 8.5.5.6. In order to install IBM WebSphere Application Server, you need to download and install IBM Installation Manager first. Download IBM Installation Manager version 1.8.5 or later from the IBM Installation Manager and Packaging Utility download links page. IBM Installation Manager opens. The installer will guide you through the entire process of installing the manager. Open the installed manager, go to File → Preferences and click Add Repository. The Add Repository dialog window opens. Enter your IBM id credentials when prompted and after the Connection status turns green, click OK. Choose the packages you want to install and click Next. If asked, install all the recommended fixes as well. In the WebSphere Customization Toolbox 8.5, open the Profile Management Tool. 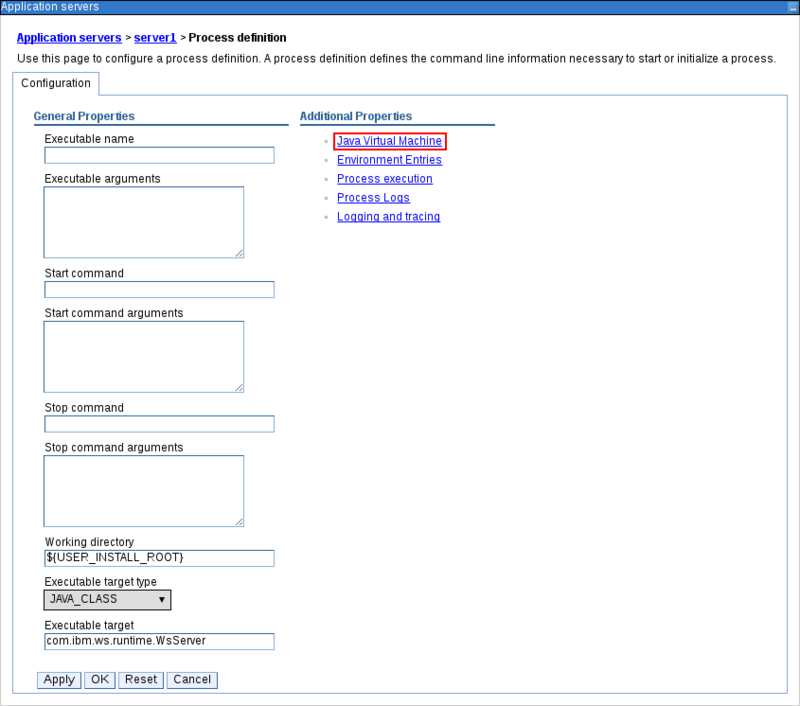 Click Create…​ and create a user for the Application Server environment. In the WebSphere Application Server - First Steps window that opens, click Installation Verification and verify that your server was installed properly. Change into the bin directory of the installed application server (by default at /opt/IBM/WebSphere/AppServer). Navigate to http://TARGET_SERVER:9060/ibm/console in your web browser and log in with the user credentials created in the previous procedure. The Integrated Solutions Console opens. For further information, see WebSphere Application Server, version 8.5.5 documentation. Red Hat JBoss BRMS for IBM WebSphere Application Server is provided as two deployable web application archives: business-central.war and kie-server.war. It is then deployed and configured as any other web application. Red Hat JBoss BRMS 6.4 is supported on the version 8.5.5 of IBM WebSphere Application Server. Installation of Red Hat JBoss BRMS on IBM WebSphere Application Server is supported since version 6.0.2 of Red Hat JBoss BRMS. This guide covers the installation and configuration of Red Hat JBoss BRMS on a full profile version of IBM WebSphere Application Server 8.5.5. Before installation, several configuration steps need to be performed to enable a successful setup. Follow the procedures in this guide to configure the server. Before you proceed, ensure you have root access to IBM WebSphere Application Server and that you are able to successfully access the IBM WebSphere’s administrative console using a web browser (usually at http://TARGET_SERVER:9060/ibm/console). Follow the steps outlined in this chapter to download and extract Red Hat JBoss BRMS for IBM WebSphere Application Server. Navigate to Red Hat JBoss BRMS 6.4.0 Deployable for WebSphere 8.5 and click Download. The downloaded installation ZIP file for Red Hat JBoss BRMS (jboss-brms-6.4.0.GA-deployable-was8.zip) contains the Business Central WAR deployable archive (business-central.war) and the Realtime Decision Server WAR deployable archive (kie-server.war) in an unextracted format. Before you can deploy Red Hat JBoss BRMS as a web archive on IBM WebSphere Application Server, configure the server to accept the deployable WAR files. Follow the steps outlined in this section to deploy Red Hat JBoss BRMS on IBM WebSphere Application Server. Log in to your IBM WebSphere console using an administrative login before performing any of these steps. The usual login URL is http://TARGET_SERVER:9060/ibm/console (for example http://localhost:9060/ibm/console). The IBM Integrated Solutions Console with the welcome screen opens. The main menu on the left side of the console contains all the links necessary for setting the application server. In the Integrated Solutions Console, go to Servers → Server Types → WebSphere Application Servers. In the list of application servers, click on the server on which you are going to deploy Business Central. For example server1. The configuration page for that server opens. Under Server Infrastructure heading on the right side, click Java and Process Management → Process Definition. Click Java Virtual Machine under the Additional Properties heading on the right. This will open up the configuration properties for the JVM that is used to start the server. Change both the Initial Heap Size and Maximum Heap Size to 2048. This is the configuration Red Hat JBoss BRMS is tested with. Click Apply at the bottom. Messages pop-up window appears at the top of the Application Servers configuration page. You can choose to save these configuration settings to the master configuration at this stage. Restart the server at this point or wait till other configuration changes have been made. In the main menu, click Security → Global Security. Ensure that the option Enable Application Security is checked. This may already be checked and overridden at the server level. This property instructs the server to invalidate LTPA tokens on session invalidation, which makes the logout process consistent across multiple users using the same browser. In the main menu on the left, click Users and Groups → Manage Groups. Create two new groups: admin and analyst by clicking Create…​. Add the kie-server group as well if you are going to install the Realtime Decision Server. Also add the REST API groups if you are going to use the API. For further information about API roles, see chapter Remote API of Red Hat JBoss BPM Suite Development Guide. In the main menu on the left, click Users and Groups → Manage Users. Click Create…​ and fill in the user credentials. Make sure that the selected User ID does not conflict with any known title of a role or a group. 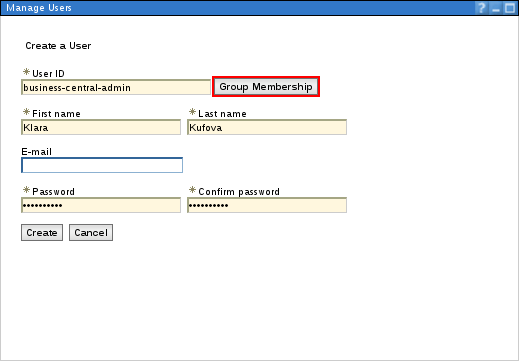 Click Group Membership and assign the user to the admin group that you created previously. You may assign this user to any of the groups you have just created. In the production systems, you are likely to create separate users for separate groups that align with business roles. The admin group is all encompassing and is therefore useful for the purposes of this setup. In the main menu on the left, go to Servers → Server Types → WebSphere Application Servers and select the server on which you are deploying Business Central. Click Session Management under the Container Settings heading on the right. In the Additional Properties section on the right, click Custom Properties and then New…​. 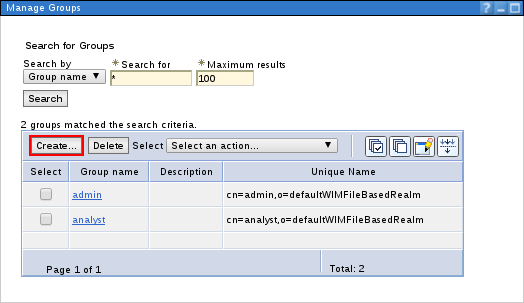 The Business Central application requires a data source which must be created prior to the deployment of the actual WAR file. This means that you must have access to an underlying database to which the data source connects. Whatever your underlying database, make sure you have the data source ready. Follow the steps below to set the data source. In the following procedure, the data source setup is demonstrated on the Oracle Database 12c. Open up the JDBC Providers page by clicking Resources → JDBC → JDBC Providers. At the top of the JDBC Providers page, click Scope. Select the scope of this JDBC provider to include your server and node. Note that it cannot be All scopes. The Create a New JDBC Provider page opens. Fill in the form based on the database driver that you have available. If your database is not listed, select the User-Defined option from the Database Type selection box and provide the implementation class name. For example, for H2, PostgreSQL, or MySQL, the implementation class name will be org.h2.jdbcx.JdbcDataSource, org.postgresql.xa.PGXADataSource, and com.mysql.jdbc.jdbc2.optional.MysqlXADataSource respectively. Give the JDBC Provider a descriptive name and click Next. Provide the class path information for the JDBC driver class files you defined. Click Apply. Click Finish to accept and add this new JDBC provider. Using this new JDBC provider, you will now need to set up the actual data source for Business Central. Before you create the data source, open the persistence.xml file located in the WEB-INF/classes/META-INF directory of the Business Central WAR file (business-central.war) that you have downloaded. You will need to know the JNDI name of the data source defined within the <jta-data-source> tag. 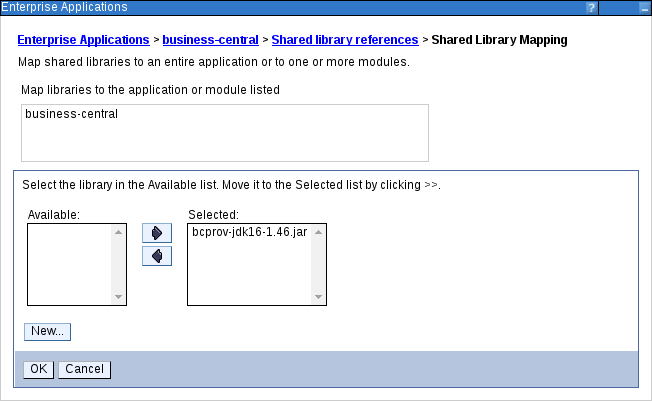 For Business Central, it is jdbc/jbpm. Also change the hibernate.dialect property to suit your database. For example, if your underlying database is Oracle Database 12c, change the property value to org.hibernate.dialect.Oracle10gDialect. Open the Data Sources page by clicking Resources → JDBC → Data Sources in the main menu on the left and make sure that the appropriate scope has been selected. Enter a unique Data Source Name by which you will refer to this data source and the JNDI name that you found in the persistence.xml file. From the Select an Existing JDBC Provider drop-down menu, select the JDBC provider created earlier and click Next. In the Enter Database Specific Properties for the Data Source step, enter the database JDBC URL and click Next. In the Setup Security Aliases screen, set the authentication values for connecting to this data source. 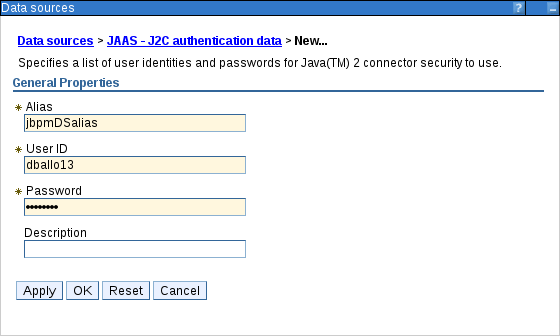 If the aliases are not yet created, click Global J2C Authentication Alias at the bottom. Note that in this case, the Create a Data Source wizard will be canceled. Fill in the Alias, User ID, and Password. Go back to the Setup Security Aliases screen and set the Component-Managed Authentication Alias to the newly created alias and the Mapping-Configuration Alias to DefaultPrincipalMapping. You can also create and set a different alias for XA recovery. If the Authentication Alias for XA Recovery is set to (none), the component-managed authentication alias is used by default. In the Summary screen, check the values and click Finish. Choose to save the changes to the master configuration as well. Choose the created data source from a list of all data sources to provide the basic meta properties. Click Custom Properties under the Additional Properties section on the right. Properties like serverName, databaseName, userName, and password must now be defined and vary for different databases. Some example database properties are shown below. The test connection operation for data source DATA_SOURCE_NAME on server SERVER_NAME at node NODE_NAME was successful. IBM WebSphere Application Server must be configured to send and receive JMS messages through Red Hat JBoss BRMS. However, before you do this, a service bus must be present. Follow the steps below to create a service bus if one does not already exist. In the main menu on the left, click Service Integration → Buses. Enter the name and make sure that the Bus Security option is unchecked. Click Next and then Finish to create the service bus. Before you continue, add a new bus member. A bus member is a server or a cluster that has been added to this service bus. Go to Service Integration → Buses and click on the service bus that you have created. Under the Topology heading on the right, click Bus Members. In the Add a New Bus Member wizard, choose the server and the type of message store for the persistence in the first two steps. Depending on the previous selection, you can also specify the properties of the message store. Click Finish in the last step to add a new bus member. To send and receive messages from Red Hat JBoss BRMS, you have to create the JMS connection factories, which are needed for establishing connections used for sending messages into queues. Red Hat JBoss BRMS needs the Java Messaging Services only for the Realtime Decision Server. Use the procedure below to create the following connection factories: KIE.SERVER.REQUEST, KIE.SERVER.RESPONSE, and KIE.SERVER.EXECUTOR. The factory names shown above are suggestions only and you can change them to suit your needs and company guidelines. In the main menu on the left, go to Resources → JMS → Connection Factories. Make sure the correct scope is selected and click New. Select the Default Messaging Provider option and click OK. The JNDI names for KIE.SERVER.RESPONSE and KIE.SERVER.EXECUTOR are jms/conn/KIE.SERVER.RESPONSE and jms/conn/KIE.SERVER.EXECUTOR respectively. From the Bus Name drop-down list, select the service bus created earlier. The rest of the options are not mandatory and can be left with default values. Click Apply and choose to save the changes to the master configuration. The next step is to create the JMS queues. These queues are the destination end points for point-to-point messaging. For Realtime Decision Server, create the following queues: KIE.SERVER.REQUEST (for requests), KIE.SERVER.RESPONSE (for responses) and KIE.SERVER.EXECUTOR (for executor services). To prevent warnings in the log, create KIE.EXECUTOR queue as well. In the main menu, go to Resources → JMS → Queues. Select the Default Messaging Provider radio button and click OK.
All of the JNDI names of other queues follow the same convention as the example above. From the Queue Name drop-down list, make sure to select the Create Service Integration Bus Destination. This will open up the Create New Queue form for creating a new service integration bus. In this form, enter a unique identifier and select the bus member created earlier in this section. Click Apply at the bottom and choose to save the changes to the master configuration. A JMS activation specification is required to be the bridge between the queue and the message-driven bean. For Realtime Decision Server, create the following activation specifications: KIE.SERVER.REQUEST (for requests), KIE.SERVER.RESPONSE (for responses) and KIE.SERVER.EXECUTOR (for executor services). To prevent warnings in the log, create KIE.EXECUTOR activation specification as well. In the main menu, go to Resources → JMS → Activation Specifications. Check the Default Messaging Provider radio button and click OK.
All of the JNDI names of other activation specifications follow the same convention as the example above. From the Destination Type drop-down list, make sure to select Queue. Enter the Destination JNDI Name (as created in the previous procedure), for example jms/KIE.SERVER.REQUEST. From the Bus Name drop-down list, choose the service bus created earlier. Click OK at the bottom with the rest of the field values as default and choose to save the changes to the master configuration. You have now successfully completed the JMS configurations required for setting up Red Hat JBoss BRMS on IBM WebSphere Application Server. You must add custom properties to the JVM that is used to start IBM WebSphere Application Server. These custom properties take into consideration the configuration changes that have been outlined in previous sections of this guide. In the main menu, go to Servers → Server Types → WebSphere Application Servers. In the list of application servers, choose the server on which you are going to deploy Business Central. Under the Server Infrastructure heading on the right, click Java and Process Management → Process Definition. Click Java Virtual Machine under the Additional Properties heading. This opens up the configuration properties for the JVM that is used to start WebSphere Application Server. Click Custom Properties under Additional Properties. Create the following properties by clicking New…​. This property is only required where a CA SiteMinder TAI (SMTAI) is installed in the environment. Using this property forces Hibernate to use JDK instead of log4j for logging within Dashbuilder. CA SiteMinder TAI (SMTAI) contains an old version of log4j, which causes conflicts. This property ensures that the IBM WebSphere Apache Wink framework does not cache JAXBContexts, which negatively impacts the performance and interferes with the custom-type serialization for the REST API. Used to look up user transactions from within non-managed threads, such as timers. Defines startable beans for Uberfire. Red Hat JBoss BRMS uses an embedded version of Git for its artifact versioning. This version of Git uses ports 9418 and 8001 for standard and SSH access (org.uberfire.nio.git.ssh.port) respectively. Ensure that these embedded Git ports are not already in use in your version of IBM WebSphere Application Server. If these ports are being used and you need to change the default Git ports, they can be changed by setting the org.uberfire.nio.git.daemon.port and org.uberfire.nio.git.ssh.port properties using the steps described above. For more information, see section Configuring LDAP Principal and Role Names Matching Criteria below. The JNDI name of connection factory for responses used by the Realtime Decision Server . JAAS LoginContext domain used to authenticate users when using JMS. This argument on the command line forces the default perspective in the designer to RuleFlow instead of Full. When set to true, disables BPM support (for example, processes support). Must be disabled for BRMS. When set to true, disables the Intelligent Process Server UI extension. Must be disabled for BRMS. Save these configuration settings to the master configuration. Restart IBM WebSphere Application Server for these changes to take effect. The client applications using ssh to interact with the Git server bundled with Business Central are authenticated and authorised to perform git operations using the security API offered by the Uberfire server. 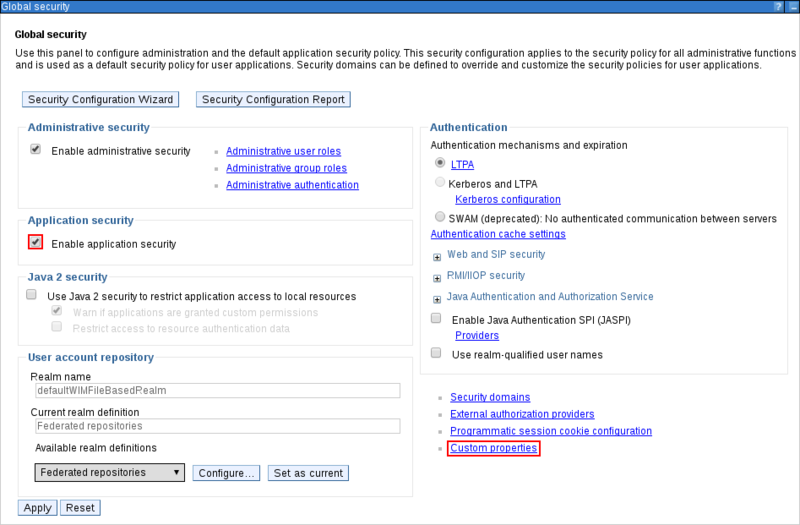 If your Red Hat JBoss BRMS application is deployed on WebSphere Application Server (WAS) using an LDAP security realm, the git clients may not be authorized as expected. This is because the distinguished name (DN) for the principal (user or group name) assigned by WAS is the more complex DN associated with that principal by LDAP, which leads to a mismatch of names when the Uberfire server tries to map the roles. To ensure that the role mapping does not fail, use the system property org.uberfire.ldap.regex.role_mapper to control the matching criteria of LDAP principal to role names. The system property org.uberfire.ldap.regex.role_mapper is a regex pattern used to map LDAP principal names to application role names. Ensure that this pattern contains the variable role as it is substited by the application role name when matching a principal value to the role name. Only after the pattern is matched, the role is added to the user. Now that the basic configuration is done and IBM WebSphere Application Server is set to deploy Red Hat JBoss BRMS, you can upload the WAR deployables that were extracted earlier. As noted previously, the Red Hat JBoss BRMS ZIP file for IBM WebSphere Application Server contains the deployable WAR files for both Business Central and Realtime Decision Server. Business Central is uploaded as a web archive and can then be accessed at http://TARGET_SERVER:PORT/business-central. Start the deployment by installing the Business Central WAR as a WebSphere application. In the main menu, go to Applications → Application Types → WebSphere Enterprise Applications. This will show you all the existing applications in the system and allow you to install a new one. 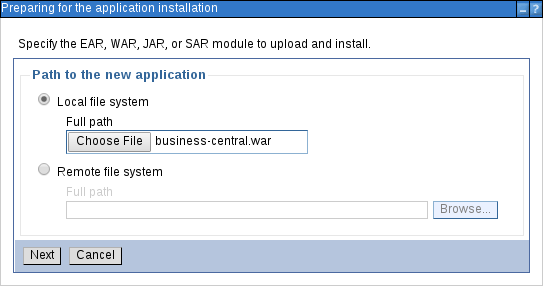 Upload the Business Central WAR file (business-central.war) from the local file system. See Section 2.2, “Extracting Red Hat JBoss BRMS for IBM WebSphere Application Server” for more information. Click Next. This process may take some time. The EAR file could be corrupt and/or incomplete. Make sure that the application is at a compatible Java(TM) Platform, Enterprise Edition (Java EE) level for the current version of WebSphere(R) Application Server. In that case, run ulimit -n in the command line. If the result is 1024, increase the number of open file descriptors. The recommended value is 100 000. Select the Fast Path radio button and click Next. Change the Application Name to business-central in the Select Installation Options step and click Next. In the Map Modules to Servers step, map the Business Central modules to servers according to your requirements. In the Map Virtual Hosts for Web Modules step, leave the default values and click Next. In the next step, set the context root to business-central. In the Metadata for Modules step, leave the default values and click Next. In the Summary page, click Finish to install Business Central. This process can take a while. Save the changes to the master configuration at the end of this process. You will be returned to the WebSphere Enterprise Applications page where business-central will be listed as a new application. However, it will be stopped at this stage. Before you start the application, you need to map groups to roles, configure class loading, and enable the Bouncy Castle Crypto API. 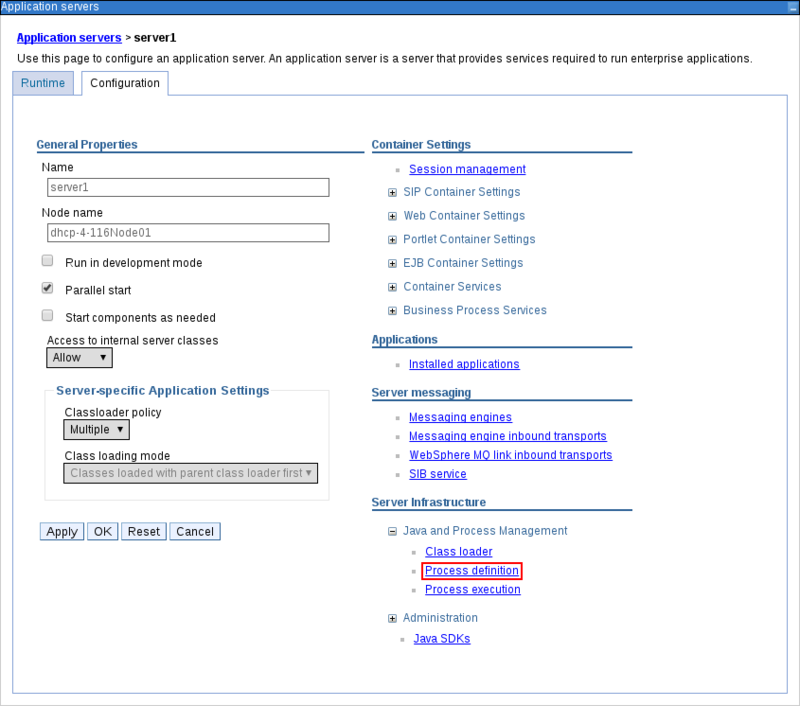 Click on the business-central application to open the application configuration page. Click Security Role to User/Group Mapping under the Detail Properties heading on the left. Select the admin role and click Map Groups…​ at the top. Search for the admin group (or just click the Search button) and move it from the Available list to the Selected list. Click OK. This mapping gives the previously created administrator user access to the Business Central application. Follow the same procedure for the analyst role as well and save the configuration. If you have other groups or users that should have access to Business Central, use the same steps to map them to the admin or analyst roles. If you are also installing the Realtime Decision Server, give this user access to the kie-server role. Additionally, map appropriate REST API roles if you are going to use the REST API. For further information about API roles, see chapter Remote API of Red Hat JBoss BPM Suite Development Guide. Ensure correct class-loading configuration by following the steps below. Click Class Loading and Update Detection under the Detail Properties heading on the left. Click OK, save the changes to the master configuration and restart the IBM WebSphere Application Server. To enable Git SSH repository cloning and kie-config-cli from within Business Central, the Bouncy Castle Crypto API must be set up. Enable the API by following the steps below. Set the org.apache.sshd.registerBouncyCastle property to true and org.uberfire.domain property to WSLogin. See Section 3.7, “Adding Custom JVM Properties” for detailed instructions on how to set custom properties. In the main menu on the left, navigate to Environment → Shared Libraries, select the appropriate scope and click New…​ to create a new library. Give this library a name and set the class path to the Bouncy Castle library (bcprov-jdk16-1.46.jar). Click OK and save the configuration. For more information about the bcprov-jdk16-1.46.jar package, see the Maven Repository — Bouncy Castle Provider page. Go to Applications → Application Types → WebSphere Enterprise Applications and click business-central. Click Shared Library References under the References heading on the left, select the web module, click on Reference Shared Libraries and move the Bouncy Castle library created in the previous step from the Available to the Selected list. You have now successfully installed Business Central on IBM WebSphere Application Server. To start the application, go back to Applications → Application Types → WebSphere Enterprise Applications page and select the business-central checkbox before clicking Start. To access the application, navigate to http://TARGET_SERVER:PORT/business-central in your web browser. The Realtime Decision Server is distributed as a web application archive file (kie-server.war) and is present in your Red Hat JBoss BRMS 6.4.0 Deployable for WebSphere 8.5 download. It is assumed that you followed the steps described in Section 3.3, “Creating Users and Groups” to create the role kie-server required by the Realtime Decision Server. If you have not done so, revisit the respective sections in this guide. In the main menu on the left, go to Applications → Application Types → WebSphere Enterprise Applications. Upload the Realtime Decision Server WAR file (kie-server.war) from the local file system. The Install New Application wizard opens. Change the Application Name to kie-server in the first step and click Next. In the next step, map the Realtime Decision Server modules to servers according to your requirements and click Next. In the Bind Listeners for Message-Driven Beans step, select the Activation Specification radio button for both beans and enter jms/activation/KIE.SERVER.REQUEST as Target Resource JNDI Name. In the next step, map resource references to actual resources. Enter the JNDI name for the KIE.SERVER.REQUEST connection factory that you created earlier: jms/conn/KIE.SERVER.REQUEST. In the next screen, set the context root to kie-server. Click Finish to install the Realtime Decision Server. Save the changes to the master configuration at the end of this process. Navigate to Applications → Application Types → WebSphere Enterprise Applications and click kie-server. 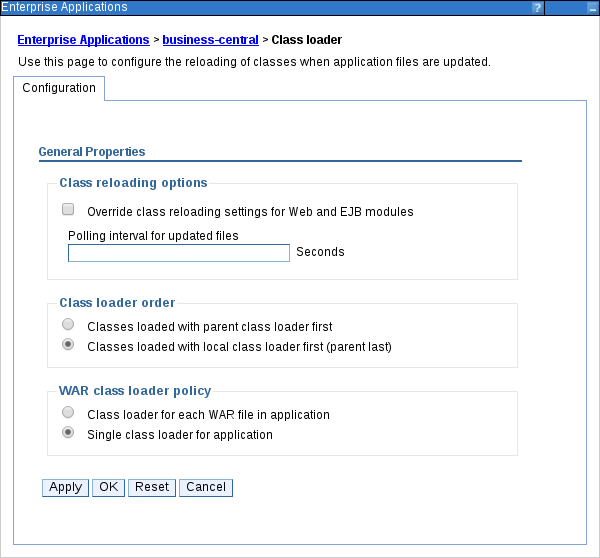 In the properties, change Class Loader Order to Classes loaded with local class loader first (parent last) and WAR Class Loader Policy to Single class loader for application. Save the changes to the master configuration. Go back to the main configuration page for the newly installed kie-server application (Applications → Application Types → WebSphere Enterprise Applications). Click Security Role to User/Group Mapping under the Detail Properties heading on the left. Select the kie-server role, click Map Groups…​ and search for the kie-server group in the next screen (or just click the Search button). Move it from the Available list to the Selected list. Click OK. This mapping gives the previously created administrator user access to the Realtime Decision Server. You can now save the changes and start the kie-server application. Check whether the Realtime Decision Server REST API works by sending a GET request at http://TARGET_SERVER:PORT/kie-server/services/rest/server.